Highly resistant to extreme temperatures, Nylon HD wheels are extra heavy duty. Able to take loads up to 7,000 lbs and will not chunk or separate under load. Resilient to bearing and friction heating. Smooth rolling and kind to floors. Capacities rival those of steel wheels. Careful attention is paid during the bonding process to assure that each wheel meets high performance standards. 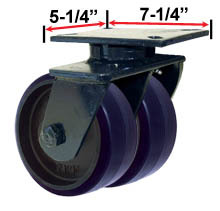 UI wheels are non-marking, and resistant to abrasion, chemicals, and oil. These wheels will typically outlast rubber wheel.